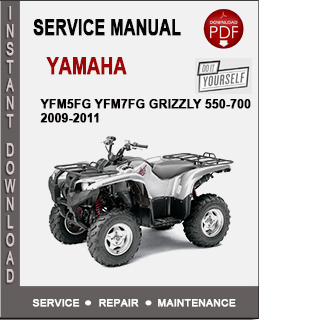 Yamaha YFM5fg YFM7fg Grizzly 550-700 2009-2011 Service Repair Manual PDF Download. Is the same manual used by technicians at the dealerships to maintain, service, diagnose and repair your vehicle. Is very detailed and contains step by step instructions and repair info. Download the service manual and fix your problems now.